1) Easy come. Easy go. Remember that Amazon Cafe whose presence we noted on N. 12th Street across the street from McCarren Park? Well, stick a fork in it because it's done. 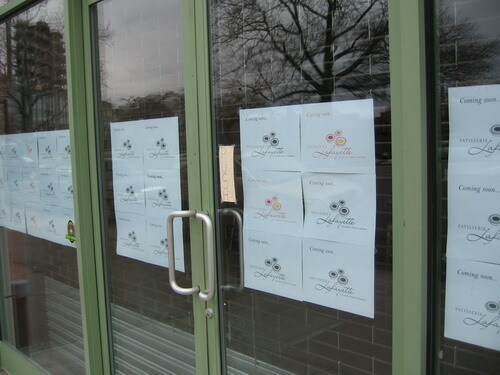 We found it closed on Sunday with signs for the Patisserie Lafayette all over the door and windows. The Patisserie is opening soon. Or so they say. 2) There's a pizzeria coming to 237 Bedford Avenue near N. 4th Street. This news is reported by A Test of Will, which found work permits for the conversion in the storefront adjacent to the pet store. No word on whether the pizzeria will be a restaurant or, you know, a pizzeria. From Where Might the Roebling Oil Have Come?